BIU has sent the sample of agreement to the delegates of host countries and they are checking it now. If there is no problem, BIU will send the original agreement to these delegates as soon as possible by post. The E.B.U thanks to the Italian organisers for the perfect preparation of the event in Sonico. GRAZIE! Last weekend the third round of the European Cup took place and it was only right that this final round of the EC 2011 series should have taken place in Italy. The whole competition was superbly organised by the team of wonderful people under the leadership of Giuliano Gualeni and his wife. All of them contributed to creating a great atmosphere with their friendly, heartfelt approach, which accompanied the entire weekend. The organisers prepared a great accompanying program on Saturday and Sunday evening along with fantastic, honest Italian cuisine. A huge thanks goes to everyone who took part in the preparations and the actual event. We leave with great memories and look forward to the next meeting in Sonico. La scorsa settimana é stato il terzo European Cup e é molto bene, che questa finale della série OF THE EC 2011 é stata affetuata proprio in Italia. Il team delle bravissime persone sotto la quida di Giuliano Gualeni e la sua moglie hanno organizzato tutta la competition. Tutti con il suo cordiale e soriddente aproccio hanno creato una atmosfera escvisita,quale ha accompagniato tutta la fine della settimana.Per sabato e domenica sera é stata preparata dai organizatori una programa, che accompagniava eccezionale,onesta cucina italiana. Tutti che sono stati mesi nella preparazione e nell procedimento di tutto avento meritano grande ringraziamento. Ci sono rimasti a noi bellissimi ricordi e non vediamo l´ora di prossimo incontro a Sonico. 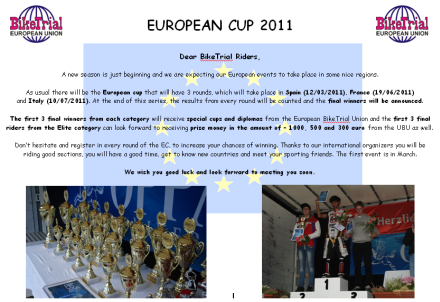 We invite you to the 3rd and final round of the European Cup 2011 in Italy. 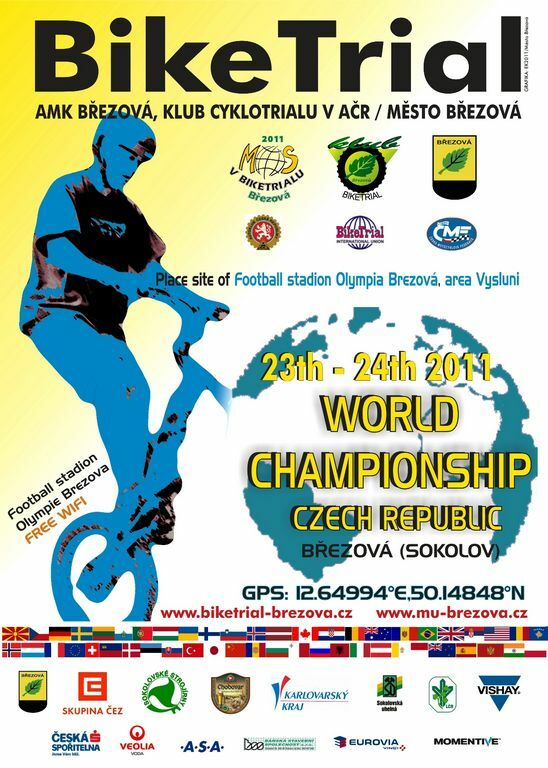 We are looking forward to good prepared competition and to seeing you there. after the perfect first round of European BikeTrial Cup 2011 in Saix, France, Italian BIU Delegation and Dynamic Trial Club are on work to prepare a very good competition also in Italy the 10 July 2011. 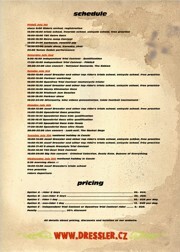 You can register in Competition till 08 July 2011. Roberto Mazzola, ASD Dynamic Trial. For information in English click to upper right corner of the web page. There are no limitations about arriving and departing time. It depends on you how much time you can stay with us. You can come any day, no registration is needed. All can be done when you arrive to the campsite. This year we already have riders from many European countries registered and we'll have riders from Denmark and Romania for the first time. 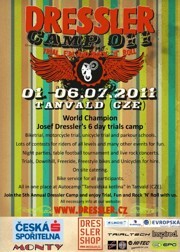 Everybody is warmly invited to spend one week full of Trial, Fun and Rock 'N' Roll in Czech! Great compliment for the organization. Only one Rider from Italy, Andrea Riva, unfortunately in Italy June is the time for school examination. Instead July / August is the time to nominate the organizer of the WBC 2012 ... !!!! 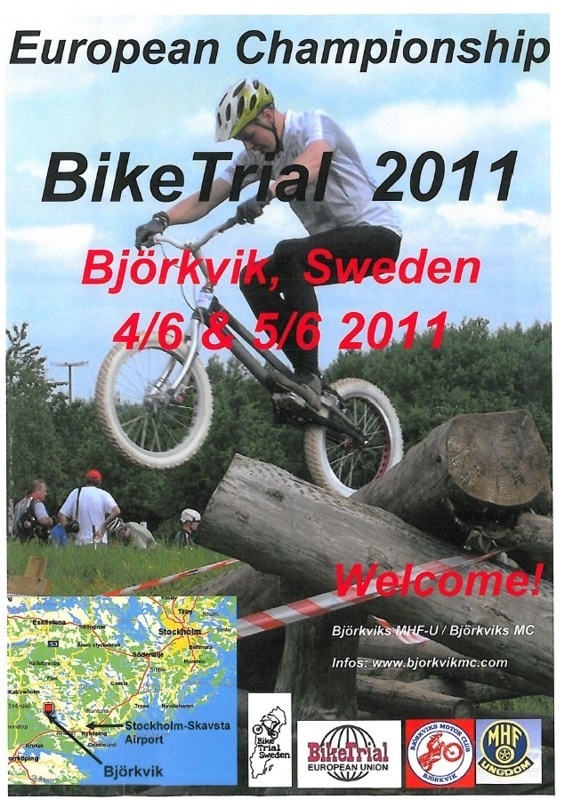 On our web site www.biketrialitalia.it we was published video and other report on EC Bjorkvik competition. THANK YOU SWEDEN AND GREAT CONGRATULATION. The European Cup event, that was to take place on 12.3.2011 in Torradenbarra in Catalonia has been cancelled. The final decision on the cancelling of the event had, in the end, to be taken by me.